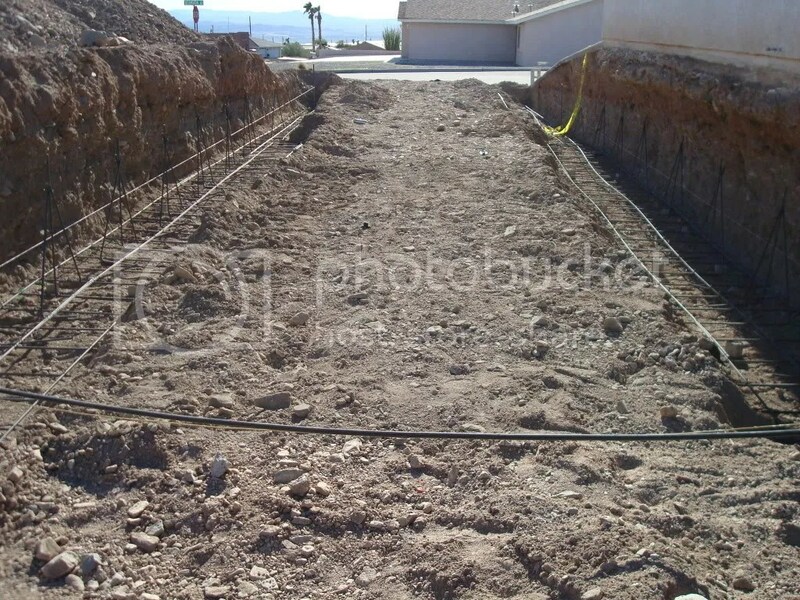 New footings, new rebar, raw sewage…OH MY! Yesterday Mister was hoping I would post new pictures of the footings that were dug for the Beast’s (the RV) garage (I’ve put these and a couple of others on the Garage Project page). I was too tired to do it last night, but I wasn’t going let him down tonight! After getting the footings dug, the crew got all the rebar set in it yesterday. After they finished, we were anxiously waiting for the city inspection so the crew could move on to pouring concrete. Ok, Mister was the one anxiously waiting. I’m really just observing the process. 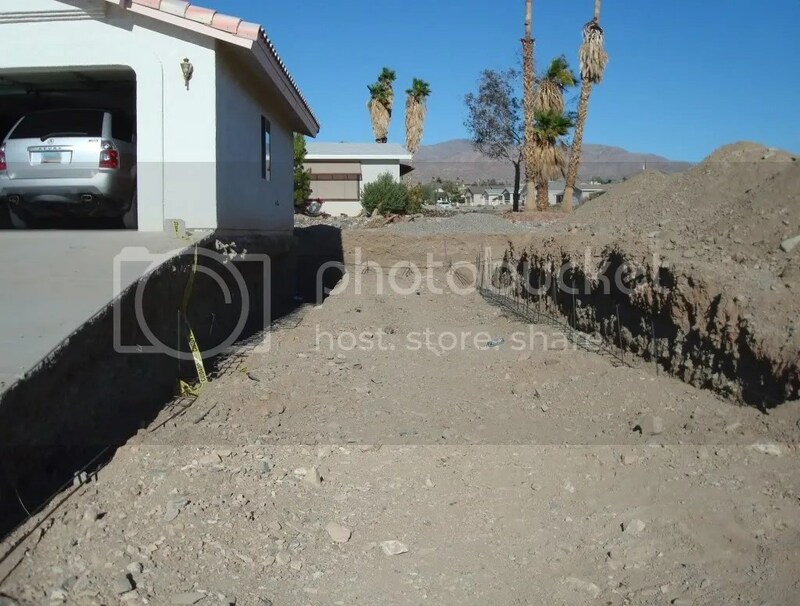 We also needed the plumber to come out ASAP to dig the trench that will connect the sewer lateral and bring a dump (sewer connection) into the Beast’s garage. I’ll wait a moment while you either say, “ewwwwww” or make a stupid/funny joke in your head about the Beast needing to have a dump. Ok, moving on…. The Inspector finally came out late this morning and signed off on the work that’s been done. We had to wait until the afternoon for the backhoe guy to come out and start digging for the dump/sewer line. He didn’t get here until around 4:30. Mister and I went out to dinner and when we came back around 6:30 we didn’t see any vehicles around. So Mister went out back to see what how much work was done. I head out to the back door in time to see the plumber’s van out there and hear the plumber speaking rather forcefully on the phone. As Mister walked towards me I asked him if all was well. Um… Nope. Turns out the backhoe guy busted the sewer line. The brightly marked sewer line. Why? Because he thought it was lower than it actually was. Now, if I had a backhoe that was capable of digging deep trenches and moving tons of dirt and rock, the first thing I would do is assume the sewer line I am directly working over is deeper than I *think* it might be. That’s genius right there. As a result, Mister told all of us that we were not to use any water unnecessarily. As he said that, the two green tea drinks I had consumed at Panda Express decided they no longer needed to take up space in my body. Also at that moment Josh happened to walk up and mention that he needs a shower because he didn’t take one yesterday. Lovely. We all agreed to try our best to maintain the status quo unless it was absolutely necessary to change it (if you know what I mean, and since you’re smart I know you do.) Thankfully the plumber came to the door 15 minutes later and said he had been fixing the issue while we were out and everything was now ok. I was very relieved. Literally. The kids (especially the teenage girl) were very happy to know they could now get their showers. Me, I was just happy to know the bathrooms were available for use at any time I pleased. Because you simply don’t appreciate that until it’s NOT available. This is NOT my picture it belongs to MacJams.com.... I just think this is the funniest Septic Truck I've ever seen! “You need to eat more.” Wha?!?! ……..”because you simply don’t appreciate that until its NOT available”……………. The world is my bathroom and now you know why! 🙂 Little things like broken pipes don’t stand in MY way! Just putting that out there for all the heat I take about “using” the great outdoors. Glad it was quickly remedied though, I know how girls like to have their indoor plumbing, that’s for sure!